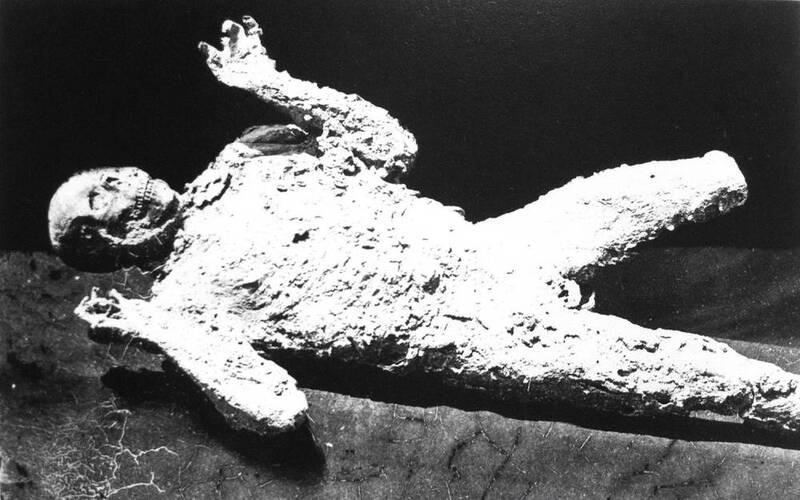 During excavations on the archaeological site of Pompeii in 1865, they thought to get a cast from the impression left in ashes by a wood door. From that day there were several others tempted like this but all with poor results. 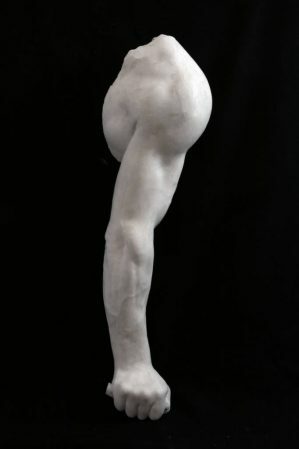 Other attempts were made before in 1831 in order to take human plaster casts from the ashes or partial as the cast of a woman in the Domus of the Faun. Another test was repeated in 1861 on the natural molds left in the ashes by a woman holding a box with jewels. 10 and VII 14 (which than was called street of skeletons) plaster was poured into a cavity of the ashes compact, recognized as the cavity of the impression left by a charred body. Breaking the mass of ash (like a waste mold) they got the plaster cast of a man lying on his back; a woman who had fallen on its side; a girl dropped her head on his left arm; a woman called ‘pregnant’ for the swollen belly. Even if they reported some defect due to technical execution still imperfect the casts were immediately on display in the Antiquarium. This was a very important event in the history of the excavations of Pompeii and the technique of excavation and restoration. From that moment on, the practice continues to this day. Fiorelli was an eclectic man and attentive to his work study. 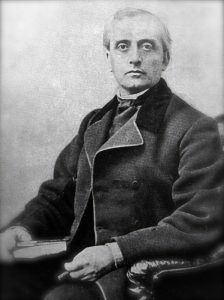 Became inspector of Pompeii in 1847 and later became the excavations director from 1860 to 1875. 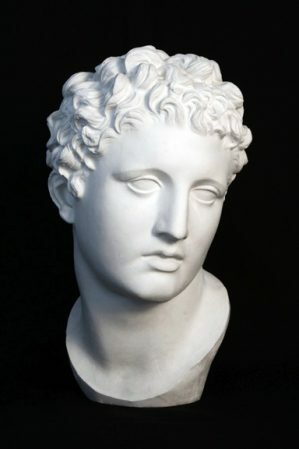 He was responsible for the distribution of the whole area of the antique city in Regiones (districts) and Insulae (isolated). 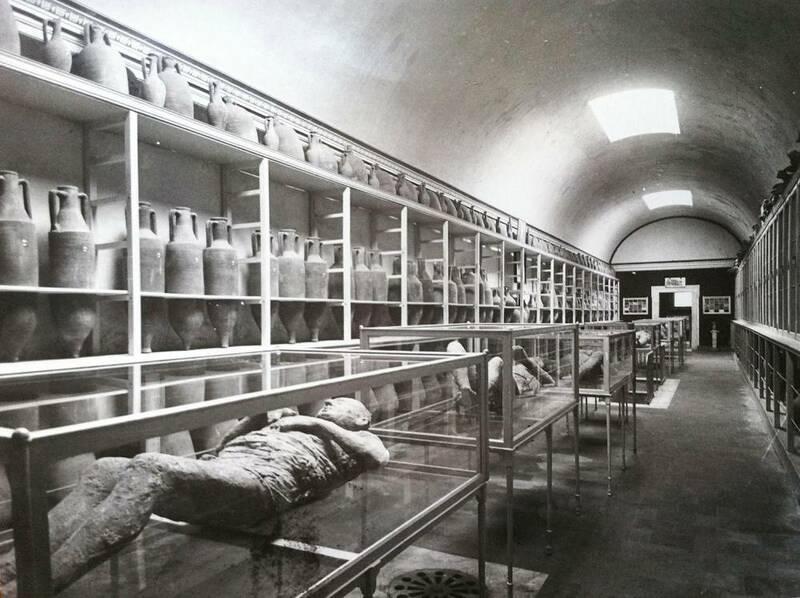 Fiorelli ​​perfected the technique of casting with his staff of technicians, so in 1868 in a room of the Domus of Marcus Gavius Rufus were found several skeletons and on one of them they make a perfect plaster cast. It was a man fell forward with his arms raised. The photo of the cast is very well known even if it retracts into the not exact position to show the face that seems terrified. 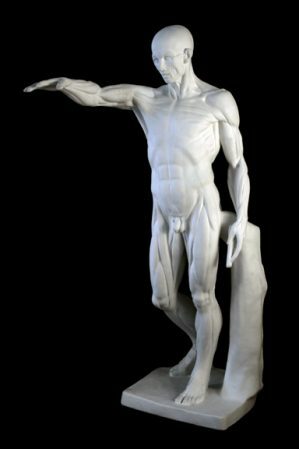 Giuseppe Fiorelli conceived the idea of the museum with the human casts as principal work of art to show so the practice of obtaining plaster casts from the ashes continued in the following years. 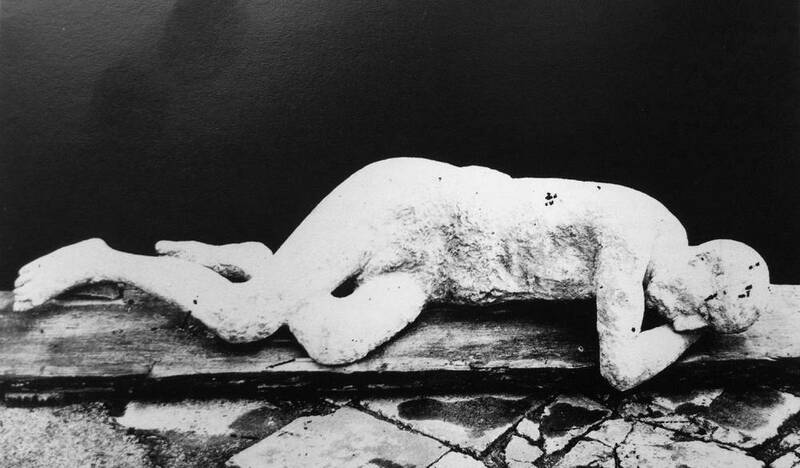 During an excavation in the Domus of Orfeo in 1874 was make the cast of a dog on a chain whose image became very well known, the cast is still visible today at the excavations. In 23 april of 1875 in the Insula VI 14 was make the casts of a woman and a man on his back wrapped in a cloak. 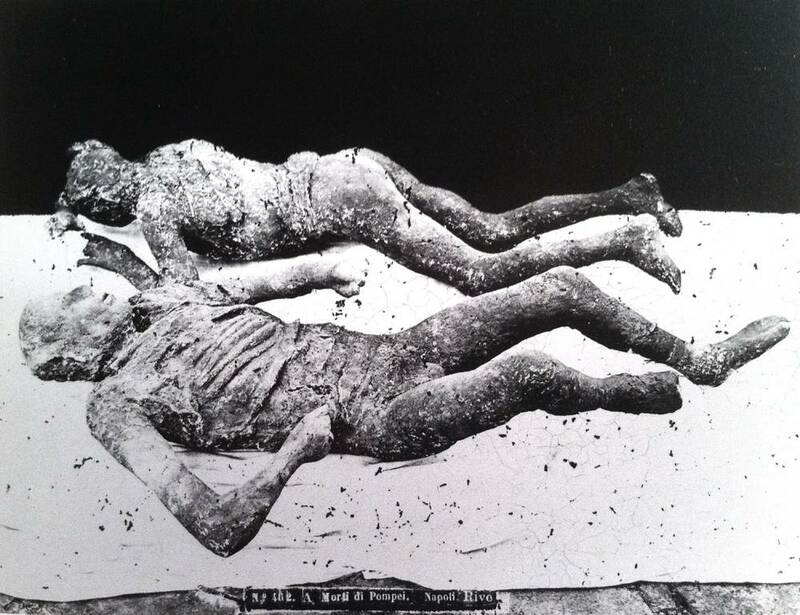 In the following years, he continued to apply the method of Fiorelli although usually the bodies (in plaster) were left in situ. 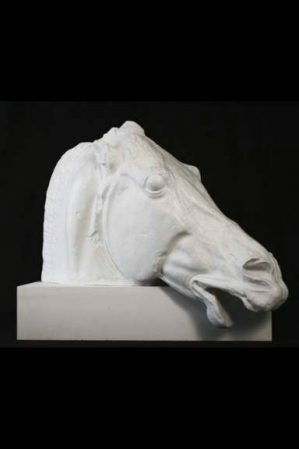 On a technical point of view the method of Fiorelli, to make the plaster casts, is very simple in its brilliance. In optimal conditions, where the body was covered with hardened ash, once decomposed, it leave a perfect cavity like a mold. There was possible to do two or more holes in that parts considered higher. Then they began to pour liquid plaster of Paris with glue into the holes while the air gradually came out from the other holes around. When the plaster came up, also from the holes of the upper parts, the cavity (and the cast) was filled and complete. 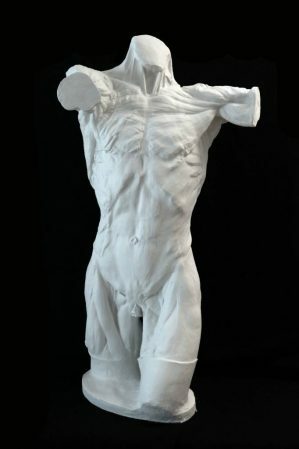 When the plaster was hardened the ash was broken and removed so the plaster body rises and finally admired. In this way the plaster contained within it some bones and possibly ornaments (usually jewelry or money) that the persons kept when they fled before the death. In modern times attempts were made with transparent resin to leave visible the bones and objects, but the results was not the best accusation by the opacity of the resin across the years and the macabre aspect of the cast (Villa of Lucius Crassius Tertius). 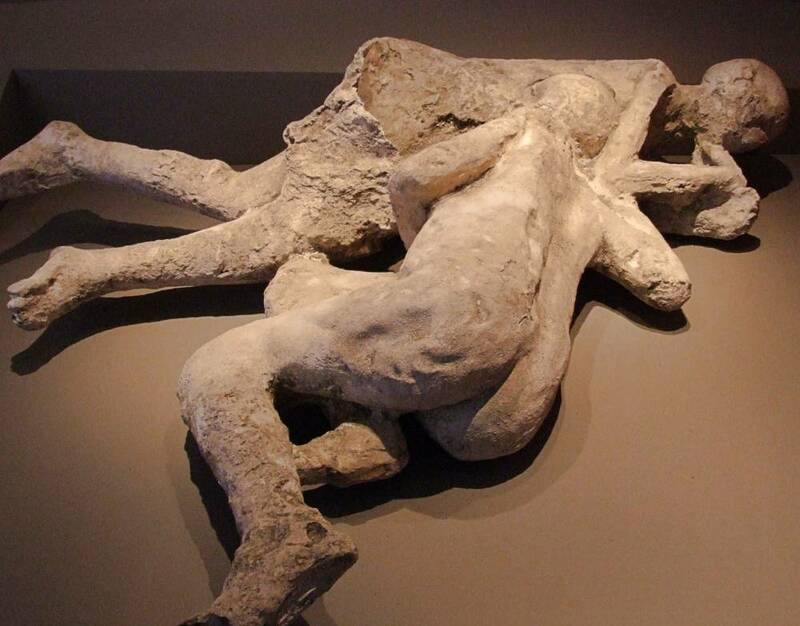 The Plaster cast of Pompeian victims have become well know all over the world through famous images, documentary, films and exhibitions. So we could say that the casts of Fiorelli have become an icon.